Georgia Bragg’s mid-grade book, How They Croaked; The Awful Ends of the Awfully Famous (Walker & Co.) is the perfect example of how a writer can take a common subject and give it a twist. Think you know everything there is to know about icons like Columbus, Mozart and Washington? Think again. Bragg brings you the gruesome, gory, yucky truth about their last days. Each chapter gives you a nifty mini biography so that anyone can appreciate the tragic deaths that are the focus of this book. But that alone is not the hook, it is also the warning she gives – “If you don’t have the guts for gore. Do not read this book” – likening the reading of How They Croaked to watching Bambi’s mother die over and over again, but worse! Although appreciative of the famous achievements of each of the 19 famous people, Bragg does not hold back the snarkiness when it comes to the medical professionals who supposedly cared for these kings, queens and geniuses, leaving nothing to the imagination as she describes barbaric treatments such as leeching, cupping using a scarifactor with spring-loaded blades, drilling a hole into Beethoven’s stomach and then plugging it up with rags, and the ten doctors who took turns poking their dirty fingers into the wound in James Garfield’s back to locate a bullet that would not have been fatal if it had been left in place. Kids, especially boys, will love every garish detail, as well as the cool facts, sarcastic how-tos, and terrifying trivia at the end of each chapter. Kevin O’Malley’s black and portraits, boarders and spot art are a perfect quirky compliment. Congratulations NCTE Orbis Pictus Winners! The winner of the National Council of Teachers of English Orbis Pictus Award for Outstanding Nonfiction for Childern was announced today. Congratulations to Melissa Sweet for her beautiful picture book Balloons over Broadway: The True Story of the Puppeteer of Macy’s Parade. But I'd like to congratulate the folks at Boyds Mills Press and their imprint Calkins Creek for collecting one honor and having 3 of their books included on the short Recommended list -- Harold Holzer was honored for his Father Abraham, and the recommended titles include: Billions of Years, Amazing Changes: The Story of Evolution by Laurence Pringle, illustrated by Steve Jenkins, Inkblot by Margaret Peot, and For the Birds: The Life of Roger Tory Peterson by yours truly and the amazing illustrator Laura Jacques! Maybe someone will take me out tonight?!?!? 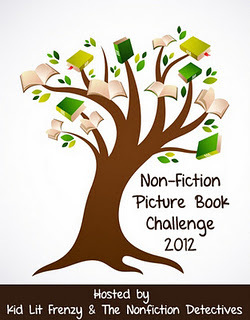 I am so proud of the amazing nonfiction books for children that are published these days. 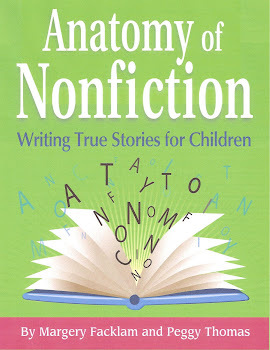 But there is always room for more, and if you have ever thought about turning your love of reading children's nonfiction into writing children's nonfiction there are all sorts of books, conferences and workshops out there to help. For twenty years I have been learning from other writers and continue to do so. But now I have the privilege of giving back. From May 20-26 I will be working with the Highlights Foundation to help other writers at THE WHOLE NARRATIVE WORKSHOP. Although I am one of the teachers, I am SO excited to hear what fellow instructor Susan Campbell Bartoletti has to say about how she creates her award-winning books like Hitler Youth. 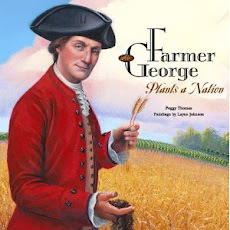 Elizabeth Partridge will also be there talking about writing biographies. I'm hoping I can add to the discussions about research, interviewing, crafting a strong storyline and more. I have to admit that I am a little nervous to have on the faculty my editor Carolyn P. Yoder. I know it will be great, but a little part of me feels like a kid having to spend the weekend with her teacher. She has seen my mistakes and knows my weaknesses, but together we may be able to give a clear picture of the author/editor relationship. More importantly I am excited to read the manuscripts of new writers with new ideas and new approaches to nonfiction, and be able to help them become published authors. The Whole Narrative Workshop is May 20-26, and the last day of registration is approaching soon. If you are interested I encourage you to check out this website for all the details - http://www.highlightsfoundation.org/content/whole-narrative-nonfiction. The colorful multi-media collage on the cover created by Susan L Roth instantly draws you in to this amazing story of one man and a great idea. The layers of paper and fabric create a wonderful sense of perspective and texture even on the end papers, and supports the text beautifully. On the right hand side of every double page spread the reader learns how Dr. Gordon Sato, a cell biologist, came up with the idea to plant mangrove forests along the coast of the impoverished country of Eritrea. 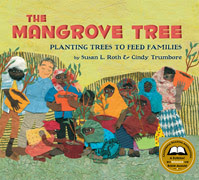 There is a lot of science in the story as Roth and her co-author Cindy Trumbore explain how the mangroves need to be supplemented with fertilizer and iron, and how the forests are planted. On the left hand side, the text builds in the style of “the house that Jack built,” reinforcing the accumulative good that the mangrove provides. The leaves and seeds are used to feed goats and sheep, the trees and the healthy livestock provide an income for the women, and provide food for the families, and even the roots create a healthy habitat for fish and other sea creatures which can be harvested by the fishermen. The Afterword is filled with much more detail about Sato’s life. He grew up in the Manzanar War Relocation Center during WWII and even named the mangrove project after that camp where he learned to grow corn for his family to eat. The Manzanar Project continues in Eritrea and has spread to Mauritania and Morocco with plans to help South American countries as well. For more information about the project check out http://themanzanarproject.com. I have crapped around with how to write a writer’s blog that deals with how I feel in a writerly way, but I can’t. So I’m just going to say what happened. My father-in-law died this past weekend after a valiant struggle with Parkinson’s and a week-long vigil at his bedside. I stayed home much of that time to take care of the dogs and cats so my husband didn’t have to worry about anything. Yet, my mind was in that room the whole time. I didn’t write. I didn’t want to. Somehow, spending time doing normal things seemed sacrilegious. So I did abnormal things (for me, anyway). I cleaned the fridge. I sorted files. Dusted, vacuumed, swept, and washed dishes. The few times I tried to write this blog, I stalled out after just a sentence or two. I thought I could write about how to overcome distractions as a writer, but it seemed wrong to call my father-in-law’s death a distraction, and I didn’t have any advice anyway. The fact is there are more important things in life than trying to write a blog, or revising a picture book manuscript, or researching elephants. The fridge and the dishes weren’t important either, but they were my way of acknowledging that my life has changed in a profound way. One thing I loved about my father-in-law, Bob Thomas, was how passionately he enjoyed beautiful things. He loved photographing the sunsets off of Cape Cod, capturing the ever-changing play of color, light and shadow. He could call chickadees, loved jazz, and told bad puns. He was silly, especially with his grandkids who shared his enthusiasm for giant bubbles and soaring kites. He had his serious side too. He knew there was work to be done. But then again -- look at that sunset! Thanks Dad! I love you.